Inside the DigiTruck at Tuleeni Orphanage. Courtesy of Arrow Electronics. The future will, for thousands of children around the world, arrive in a corrugated metal box. The DigiTrucks is billed by its creators as a “mobile IT unit.” It is, in fact, a solar-powered computer lab built into a 12-metre long shipping container. Produced by Close the Gap, an international non-profit that provides second-hand computers to schools, hospitals and social programs in developing countries, and in partnership with Fortune 150 electronics company Arrow, DigiTrucks brings information and communication technology to communities where there is sparse access to electricity, let alone to the Internet. 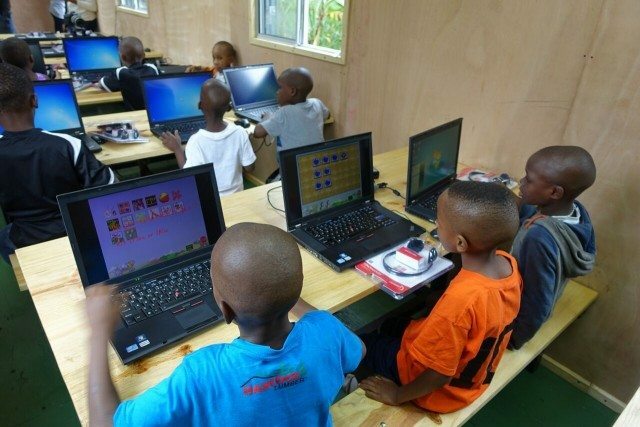 We’re talking very rural spots in sub-Saharan Africa—places where a movable, self-powered digital classroom is not just convenient, but necessary. The first DigiTruck was built for Red Cross Burundi in 2014. In August of this year, another version was built, with help from local workers, for Tuleeni Orphanage in Tanzania, where it is now used by more than 80 kids. This model includes 20 laptops, two routers, a printer, data storage, an LED screen and enough space for 18 people to work in there at once. The DigiTruck will stay at Tuleeni for a few more months before it is shipped to another community in 2016. But the electronic equipment will stay behind. Arrow will source new equipment for the DigiTruck and leave a permanent digital learning space at Tuleeni. It’s a nice heart-warming story, fit for the almost-holiday season. But why is the DigiTruck a useful innovation for Toronto, a place with ample electricity and internet access in bars, coffee shops, subway stations, and public bathrooms? Well, because as we’ve mentioned in this column before, internet access is commonplace only for those Torontonians with a certain income. There are a troubling number of people in this city, and across Canada, who are not connected to the Internet specifically because they can’t afford it. And that puts them at a major disadvantage when it comes to educational achievement, finding employment, and interacting with society on even a basic level. There was once a very popular amenity in cities called the Bookmobile. Consult your nearest Baby Boomer for more details. It was based on the idea that not everyone had equal access to reading material. (Improbably, and wonderfully, these things still exist in Toronto). How much of stretch would it be to bring the Internetmobile, the DigiTruck, to communities here?